The post is called Dual Threat because this showcases my MURICA Monday 1/18th and 1/64th submissions. I obtained the C4 above via EvilBay about a year and a half-2 years ago. 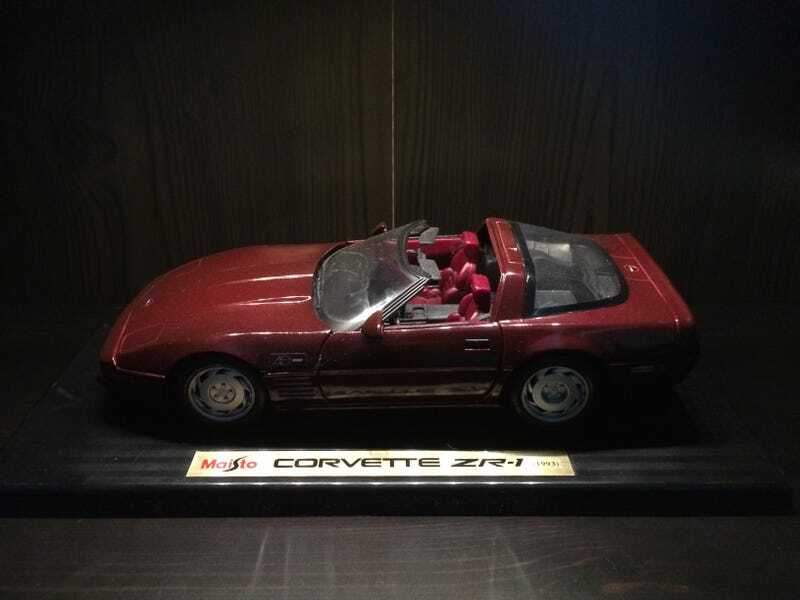 It’s a Maisto-brand 1993 Chevrolet Corvette ZR-1 40th Anniversary edition, in Ruby Red. Like the car it was based off of, it was built to celebrate the 40th anniversary of the iconic Corvette. It’s one of only two cars I’ve kept on its stand, the other being another Maisto C4, that one 1996 Collectors Edition convertible in light blue. The engine has ok detail, nothing to write home about. And now, Corvette Photodump. The 1/64th submission is farther down, past the photodump. The other Maisto 1/18th C4 is in the background, as well as the Ion. This shelf serves as my C4 shrine. I love the C4. If any of you recognize it, it’s because it’s almost a carbon copy of the same 40th Anniversary C4 that fell into the Corvette Sinkhole. The only difference is that this is a ZR-1. This is actually quite a rare one! This very detailed one (headlight and taillight tampos, full Saturn badging) was given away as a promo at the 2002 New York Auto Show. I also obtained this via EvilBay. Difficult to see it but there’s actually a bumper tampo. That is a tub filled with and then covered with packaging.